I think you're going to like this. Can castles! Tin turrets! 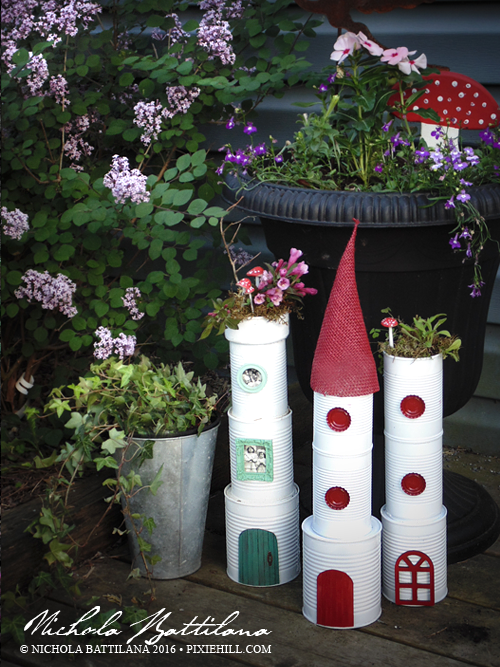 Recycled fairy garden towers! 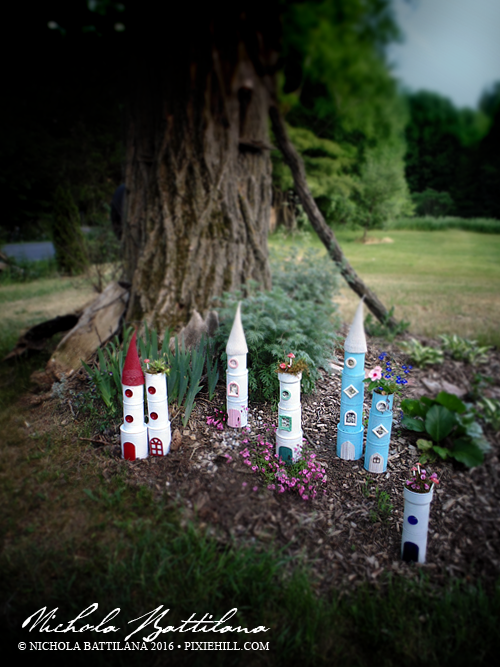 The biggest struggles setting up the summer fairy garden have been the battles with the weather and the critters. 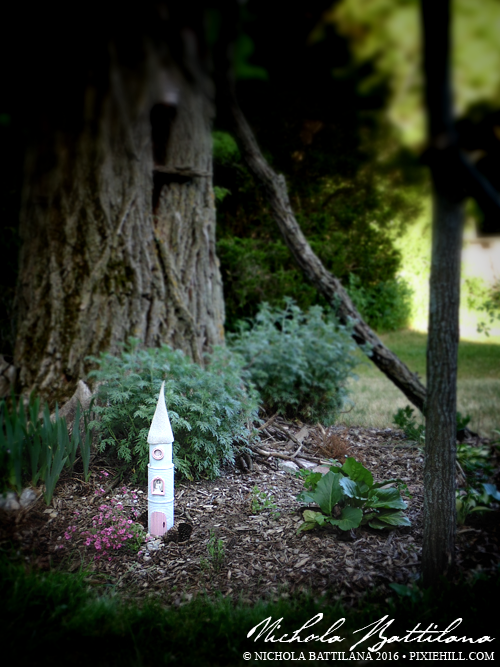 This year I was determined to come up with something a little more sturdy to survive the summer and the squirrels. These are the result of all that thinkin'. I'm kinda in love with them and want to make them in all the colours to dot around my garden. Just look at those blue beauties next to the tall poppies. Some are topped with roof top gardens (which fairies love btw). Others have really simple pointy cone roofs which are just a bit of burlap sewn into a cone shape, then spray painted. The paint adds some stiffness and helps to prevent fraying. Pretty sure that any stiff fabric would do. My initial thought was to use reusable grocery bags (reusing the reusable!) but the burlap was on hand so I'll do that next time. I've made a video tutorial for the basic version of this project so if you haven't already, hop over and subscribe to my Youtube channel. 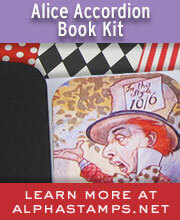 The video tutorial is below, and below that you'll find the supply round-up. 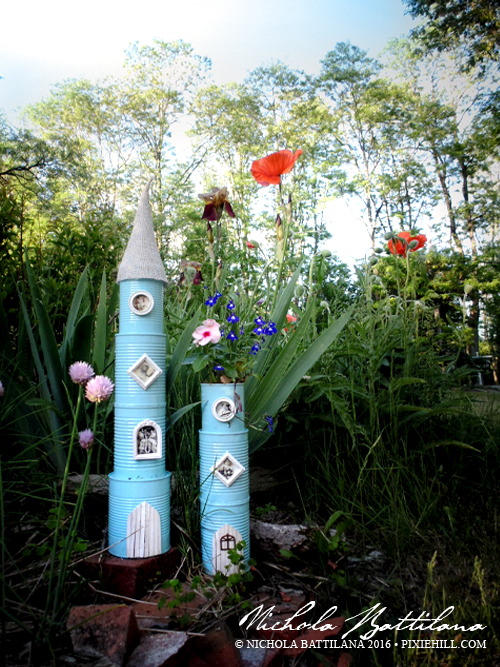 If you're inspired to make your own tin can kingdom and show it off, tag me in your post! I'd love to see what you made. Want to recreate this project for your own blog? Have at it! Just be sure to link back here please-and-thank-you. The credit for the inspiration is appreciated, and it encourages me to share more free projects. these are great, going to make them with my granddaughter! I think I will use nylon window screen for the cone top so it will be waterproof. Thanks for the inspiration! That's a really good idea! Good luck. These are adorable. You amaze me with your talent. I'm making one for my patio and making holes in the bottom can, which will have no bottom,(we all know how to do that, right? ), so that I can put it over a tea lite candle. That's how to tell if my faerie is home......the bottom floor will be lit up. Thanks Nichola. 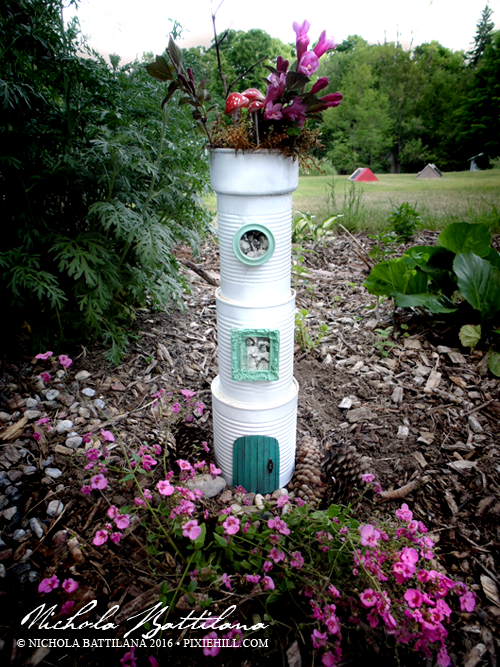 OMG - adorable and GREAT reuse!!!! That would be adorable with some of the narrow and tall tea and spice tins too... and as they age and rust, they would look so interesting as well! I hate to be a bother but any idea when you are gonna do the kiddo friendly version. 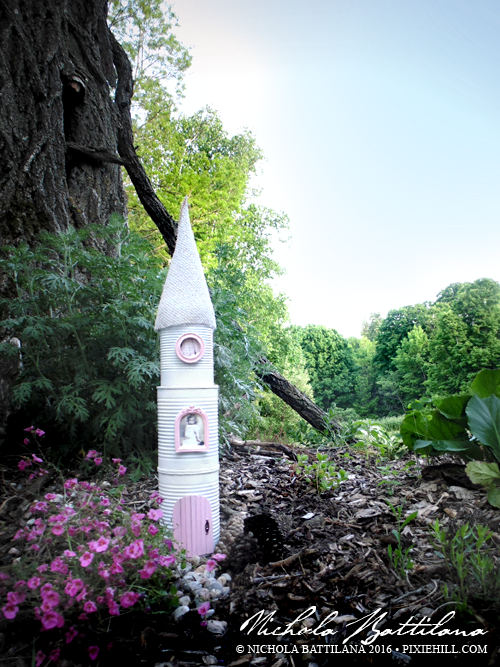 I have a special spot started for my wee one but the Fairies need a beautiful home.